Quilting is a craft that dates back many centuries, of course the emphasis then was to provide warmth and shelter. Today not only do they provide warmth and shelter, but have evolved into an enjoyable creative activity enjoyed by men and women and children all ages. Modern tools and endless choices of fabric color and design make the making of a quilt a lot of fun and I think it's an excellent time to explore quilt making. In the pages of this book, you'll find information for many different techniques as well as design ideas sprinkled though out. If he first thing you notice is all the curves – then think about this: with the exception of a few designs, each project can also be made with straight line cuts. 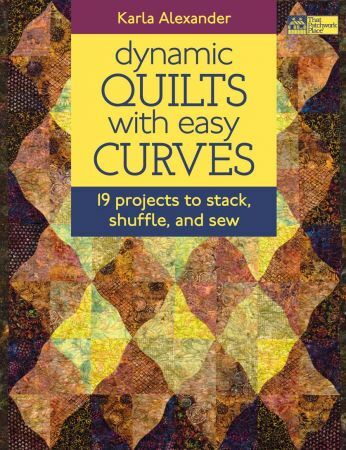 This book offers you the choice of straight line or curved cuts; it's your call! If you are uncomfortable with curvy cuts – try the same block with a straight cut and see how you like it. Another thing to note – if you're feeling a little spunky, keep in mind many of the projects can also be made smaller or larger by simply beginning with larger or smaller squares or rectangles.â€¨All the projects are meant to be used as inspiration for your own work. Follow the fabric requirements word by word or switch it up and make it your own with completely different colors and block arrangements. Work confidently using your instincts as you go. If you don't like a particular color or block arrangement – then don't settle; change it until you're satisfied. I like to build my quilts one block at a time and I encourage you to do the same.